Low-Carb Diets and Cholesterol: What Does Science Say? When referring to low-carb diets, most people only think of them in terms of weight loss. While this is certainly a key aim, low-carb eating also offers other benefits in the way your body burns fat and manages blood sugar (glucose) levels. This also includes the way in which a carbohydrate-restricted diet can positively influence triglyceride and cholesterol levels in your blood. Low-carb diets work by reprogramming our body to burn different sources of fuel. In most American diets, the primary source of fuel is glucose. Glucose is created when the digestive tract breaks down dietary carbs, in the form of complex sugars, into simple glucose molecules. With a low-carb diet, the reduction of carb intake means that your body has to find alternative fuel sources, namely fat. This change in metabolism, known as ketosis, can affect the volume of lipids (fatty molecules) that doctors use to measure heart health, namely triglycerides and cholesterol. Our body fat is made up mainly of triglycerides. When you eat, your body converts any calories it doesn't use into triglycerides. These lipids are stored in fat cells and released for energy whenever the body needs it. 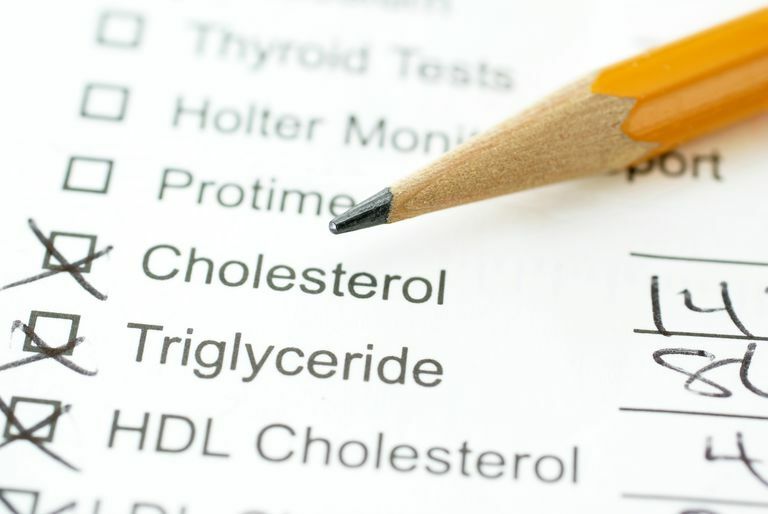 Even though the body needs triglycerides to function properly, most of us have far too much. This can result in a condition called hypertriglyceridemia in which excessive amounts of triglycerides in the blood can trigger a cascade of adverse events, including atherosclerosis (hardening of the arteries), pancreatitis, heart attack, and stroke. Generally speaking, your triglyceride level should be under 150 milligrams per deciliters (mg/dL). High triglycerides are anything over 200 mg/dL, while hypertriglyceridemia is declared when levels exceed 1,000 mg/dL. More than any other lipid, the implementation of a low-carb diet will almost always trigger a marked decrease in triglycerides. Some experts, in fact, consider a reduction of triglycerides as the hallmark of a low-carb diet. A 2016 review of 23 studies concluded that a low-carb diet (less than 45 percent of energy derived from carbs) decreased triglycerides in all populations but most especially in women and overweight people with a body mass index (BMI) over 25. High-density lipoprotein (HDL) is often referred to as the "good" cholesterol as it's seen to be protective against heart disease. As one of the key lipids in your body, cholesterol helps maintain cellular function and integrity and aids in the production of estrogen, progesterone, vitamin D, and steroids. HDL is a lipoprotein because it is composed of both cholesterol and protein. Because of the fat-like properties of triglycerides and cholesterol, they don't easily move through the circulatory system and need proteins to aid in their transport. When bound together, we measure the resulting lipoproteins in a blood test known as a lipid panel. HDL is considered high-density because it consists of less cholesterol and more protein. Its role is to scavenge for excess cholesterol and transport the molecules to the liver to be broken down. Generally, the higher the amount of HDL, the better the heart health. By increasing the metabolization of fat, a low-carb diet can often influence HDL levels, albeit less significantly than triglycerides. The 2016 review further demonstrated that a low-carb diet triggers consistent increases in HDL, even more so than with a low-fat diet (those that derived less than 30 percent of energy from fat). Low-density lipoprotein (LDL) is considered the "bad" cholesterol because it consists of more cholesterol and less protein. While its role is to transport cholesterol to the cells that need it, certain types of LDL—namely small dense LDL (sdLDL) and oxidized LDL (oxLDL)—can cause damage by sticking to arterial walls and triggering inflammation that promotes atherosclerosis. As such, LDL is not inherently "bad." It plays an important role in regulating cell function and is really only a concern if there is excessive sdLDL or oxLDL. The relationship between low-carb diets and LDL is also complex, even more so than with triglycerides and HDL. This is due in part to the increased intake of dietary fats common in most low-carb diet plans. Compared to low-fat diets, a low-carb diet often offers minimal or no reduction of LDL and total cholesterol levels. Any benefits of increased fat metabolism appear to be offset by the increased intake of dietary fat and cholesterol. While it makes sense that low triglycerides make for better heart health, the line between cholesterol and heart health is not so direct. This is especially true with LDL. There is growing evidence that a low-carb diet may alter the ratio of "bad" LDL to "regular" LDL. For example, high-carb diets tend to produce smaller lipoproteins like sdLDL or unstable ones like oxLDL. By contrast, a low-carb diet tends to spur the development of larger LDL that are less likely to get stuck to arterial walls. Similarly, low triglyceride levels are associated with less inflammation as well as larger and arguably "safer" LDL cholesterol. In term of risk assessment, cholesterol on its own is a poor predictor of heart disease. Half of the people with heart disease, including those who experience a heart attack, will have perfectly normal cholesterol levels. Furthermore, LDL has little prognostic (predictive) value unless its constituent parts (e.g., sdLDL and xoLDL) are individually measured. To this end, it is important to look at all of your diagnostic tests in relation to your personal risk factors to determine what your test results mean. Ultimately, having too little cholesterol is just as bad as having too much, inflicting short- and long-term harm on brain cells. If unsure what your test results mean, ask your doctor to explain them in relation to your current health, your blood pressure, and your risk factors for heart disease. Is Raising HDL Cholesterol a Good Idea After All? Hu, T.; Mills, K.; Yao, L. et al. Effects of Low-Carbohydrate Diets Versus Low-Fat Diets on Metabolic Risk Factors: A Meta-Analysis of Randomized Controlled Clinical Trials. Am J Epidemiol. 2012 Oct 1;176(Suppl 7): S44-S54. DOI: 10.1093/aje/kws264. Min, H.; Kang, J.; Sung, J. et al. Blood Triglycerides Levels and Dietary Carbohydrate Indices in Healthy Koreans. J Prev Med Public Health. 2016 May;49(3):153-64. DOI: 10.3961/jpmph.16.014.